Lenovo ThinkSystem SR250 is an affordable, single-socket 1U rack server for small and medium businesses that need optimized performance and flexibility for future growth, along with enterprise-class reliability, management, and security. The SR250 server offers a wide range of processors — from Intel Celeron to Intel Xeon E Series. With support for a memory capacity of up to 64 GB and internal storage of up to 32 TB, the SR250 server is an ideal choice for small- to medium-sized business, workgroups, distributed locations, and web-scale workloads. This product guide provides essential technical and pre-sales information on the SR250 server, its key features and specifications, components and options, and configuration guidelines. This guide is intended for technical specialists, sales specialists, sales engineers, IT architects, and other IT professionals who want to learn more about the SR250 server and consider its use in IT solutions. Flexible and scalable internal storage configurations include up to ten 2.5-inch or four 3.5-inch drives with affordable software RAID or advanced hardware RAID protection and a wide selection of drive sizes and types, including NVMe PCIe SSDs, SAS/SATA SSDs, and SAS/SATA HDDs. Also, it features integrated dual-port 1 Gb Ethernet NIC and additional PCIe expansion slots for hardware RAID protection, network scalability, and external storage connectivity. The next-generation Lenovo XClarity Controller, which is built into the SR250 server, provides advanced service processor control, monitoring, and alerting functions. The following figure shows the Lenovo ThinkSystem SR250. The SR250 server offers enterprise-class reliability features such as error correcting code (ECC), hot-swap components, and advanced RAID protection with flexible storage options at an affordable price. The SR250 server has a mere 19.6-inch (498 mm) deep chassis, helping customers reduce their business footprint. The SR250 server offers performance, energy efficiency, and serviceability features, such as NVMe PCIe SSDs, 80 PLUS Gold and Platinum certified power supplies, and easy access to upgrades and serviceable parts (such as memory DIMMs and adapter cards), which is not typically found in the single-socket value servers. The SR250 server offers easy-to-use, enterprise-class manageability to monitor server availability and perform remote management with the built-in Lenovo XClarity Controller. The SR250 server is a compact, cost-effective, single-processor 1U rack server that has been optimized to provide enterprise-class features to small-to-medium-sized businesses, retail stores, or distributed enterprises. Improves productivity by offering superior system performance with the Intel Xeon E Processor family with up to 6-core processors and up to 3.8 GHz core speeds, up to 12 MB of last level cache (LLC), up to 2666 MHz memory speeds, and up to 8 GT/s bus speed. Choice of processors with up to six cores and up to 12 threads to enable the effective use of multithreaded applications. Intelligent and adaptive system performance with energy efficient Intel Turbo Boost 2.0 Technology allows CPU cores to run at maximum speeds during peak workloads by temporarily going beyond processor thermal design power (TDP). Intel Advanced Vector Extensions (AVX) enable acceleration of enterprise-class and high performance computing (HPC) workloads. Provides memory speed, availability, and capacity of up to 64 GB memory with up to four 2666 MHz DDR4 ECC UDIMMs. Offers flexible and scalable internal storage in a 1U rack form factor with up to 10x 2.5-inch drives for performance-optimized configurations or up to 4x 3.5-inch drives for capacity-optimized configurations, providing a wide selection of SAS/SATA HDD/SSD and PCIe NVMe SSD types and capacities. Provides I/O scalability with the onboard LOM interface and up to three PCI Express (PCIe) 3.0 I/O expansion slots in a 1U rack form factor. Reduces I/O latency and increases overall system performance with Intel Integrated I/O Technology that embeds the PCI Express 3.0 controller into the Intel processors. Offers ECC protection which provides error correction not available in PC-class "servers" that use parity memory. Provides easy access to upgrades and serviceable parts (such as memory DIMMs and adapter cards) with tool-less cover removal. Offers data protection and greater system uptime with a choice of affordable onboard SATA RAID or advanced hardware RAID redundancy, along with hot-swap drives (select models). Provides availability for business-critical applications with redundant hot-swap power supplies (select models). Allows preventive actions in advance of possible failure, thereby increasing server uptime and application availability with Proactive Platform Alerts (including PFA and SMART alerts) for memory, internal storage (SAS/SATA HDDs and SSDs, NVMe SSDs, M.2 SSDs), RAID controllers, and server ambient and sub-component temperatures. Continuously monitors system parameters, triggers alerts, and performs recovery actions in case of failure to minimize downtime with Built-in XClarity Controller (XCC). Provides quick access to system status, firmware, network, health, and alerts information via Virtual Operator Panel from the XClarity Mobile App running on the Android or iOS mobile device that is connected to the front USB port with XClarity Controller access. Speeds up troubleshooting tasks to reduce service time with diagnostics built into the XClarity Provisioning Manager. Provides advanced service processor control, monitoring, and alerting functions with XClarity Controller, a next generation service processor. Improves Unified Extensible Firmware Interface (UEFI) system setup, configuration, updates, simplified error handling, and operating system deployment with the embedded XClarity Provisioning Manager. Offers XClarity Essentials software tools that can help customers set up, use, and maintain the server. Increases uptime, reduces costs, and improves productivity through advanced server management capabilities with Lenovo XClarity Administrator that provides comprehensive hardware management. Provides on-the-go monitoring and management of devices in XClarity Administrator from anywhere with the Lenovo XClarity mobile app, which can help improve efficiency and reduce downtime risks. Centralizes infrastructure resource management with Lenovo XClarity Integrators for VMware vCenter and Microsoft System Center, extending XClarity Administrator features to virtualization management software tools and enabling users to deploy and manage infrastructure end-to-end. Offers advanced cryptographic functionality (such as digital signatures and remote attestation) with an integrated Trusted Platform Module (TPM) or optional Nationz TPM (available only in PRC). Keeps user data safe with Lenovo Business Vantage, a security software tool suite designed to work with the Nationz Trusted Platform Module (available only in PRC). Offers enterprise-class data protection with advanced RAID and optional self-encrypting drives. Provides faster, stronger encryption with industry-standard AES NI support. Helps prevent certain classes of malicious buffer overflow attacks with Intel Execute Disable Bit functionality, when combined with a supporting operating system. Enhances security through hardware-based resistance to malicious software attacks with Intel Trusted Execution Technology, allowing an application to run in its own isolated space, protected from all other software running on a system. Protects application code and data from disclosure or modification with Intel Software Guard Extensions (SGX), enabling high-assurance security use cases, such as blockchain, identity and records privacy, secure browsing, and digital rights management (DRM). Delivers optimized compute power per watt, featuring 80 PLUS Gold (fixed) and Platinum (hot-swap) AC power supplies. Reduces power drawn with Intel Intelligent Power Capability that powers individual processor elements on and off as needed. Helps reduce power consumption with variable speed fans. Helps achieve lower heat output and reduced cooling needs with Lenovo XClarity Energy Manager that provides advanced data center power notification, analysis, and policy-based management. The following figure shows the front of the SR250 server with four 3.5-inch drive bays. The following figure shows the front of the SR250 server with eight 2.5-inch drive bays. 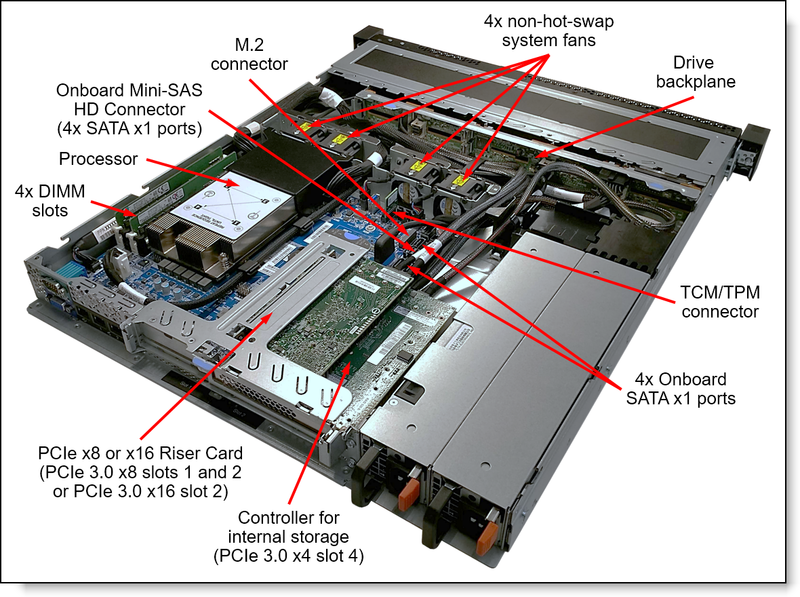 The following figure shows the front of the SR250 server with ten 2.5-inch drive bays. The following figure shows the rear of the SR250 server. The following figure shows the locations of key components inside the SR250 server. The following table lists the system specifications for the SR250 server. Processor One Intel Xeon E, Core i3, Pentium Gold, or Celeron processor. Memory 4 DIMM sockets (two memory channels with two DIMMs per channel). Support for ECC UDIMMs. Memory speed up to 2666 MHz. Memory capacity Up to 64 GB (4x 16 GB UDIMMs). Memory protection Error correction code (ECC). 4 LFF (3.5-inch) SATA Simple Swap drive bays. 4 LFF (3.5-inch) SAS/SATA hot-swap drive bays. 8 SFF (2.5-inch) SAS/SATA hot-swap drive bays. 8x 2.5" SAS/SATA & 2x 2.5" NVMe PCIe. Note: Intermix of SAS, SATA, and NVMe PCIe drives is supported within a system, but not within a RAID array. NVMe PCIe SSDs do not support RAID controllers. LFF models: Up to 32 TB with 4x 8 TB SAS/SATA HDDs. SFF models: Up to 24 TB with 10x 2.4 TB SAS HDDs. RAID 0/1/10/5 with Intel RSTe. RAID 0/1/10/5/50/6/60 with RAID 930-8i 2GB Flash or 16i 4GB Flash. 12 Gbps SAS/6 Gbps SATA non-RAID: 430-8i or 16i HBA. NVMe PCIe non-RAID: 1610-4P NVMe Switch Adapter. Optical drive bays None. Support for an external USB DVD RW Optical Disk Drive (See Optical drives). Network interfaces 2x Onboard 10/100/1000 Mb Ethernet RJ-45 ports (BCM5720 NIC). 1x USB 3.1 Gen 1 port. 2x USB 3.1 Gen 2 ports. Cooling Four non-hot-swap system fans. Power supply One fixed 300 W Gold, or up to two redundant hot-swap 450 W Platinum AC power supplies. Hot-swap parts Drives (select models) and power supplies (select models). Systems management XClarity Controller (XCC) Standard, Advanced, or Enterprise (Pilot 4 chip), proactive platform alerts, XClarity Provisioning Manager, XClarity Essentials, XClarity Administrator, XClarity Integrators for VMware vCenter and Microsoft System Center, XClarity Energy Manager, Capacity Planner. Security features Power-on password, administrator's password, secure firmware updates, Trusted Platform Module (TPM) 1.2 or 2.0 (configurable UEFI setting). Optional lockable front bezel. Optional Nationz TPM (available only in PRC). Optional Lenovo Business Vantage security software (available only in PRC). Operating systems Microsoft Windows Server 2016 and 2019; Red Hat Enterprise Linux 7; SUSE Linux Enterprise Server 12 and 15; VMware vSphere (ESXi) 6.5 and 6.7. Warranty One-year (7Y52) or three-year (7Y51, 7Y72, and 7Y73) customer-replaceable unit (CRU) and onsite limited warranty with 9x5 Next Business Day Parts Delivered. Service and support Optional service upgrades are available through Lenovo Services: 2-hour or 4-hour response time, 6-hour or 24-hour committed service repair, warranty extension up to 5 years, 1-year or 2-year post-warranty extensions, Premier Support, YourDrive Your Data, Enterprise Server Software Support, and Basic Hardware Installation Services. Configure-to-order (CTO) models can also be created for factory-integrated server customization. The following table lists the base CTO models of the ThinkSystem SR250 server. The following table lists the base chassis for CTO models of the SR250 server. All models of the SR250 server are shipped with the Electronic Publications Flyer. If the number is shown as "x", it represents the quantity of the SAS/SATA drive bays. If the number is shown as "x+y", it represents the quantity of the SAS/SATA + NVMe drive bays. XClarity Controller: "S" = Standard, "A" = Advanced, "E" = Enterprise. Front VGA port: "Y" = Included; "N" = Not included, optional. Tool-less Rail Kit: "Y" = Included; "N" = Not included, optional. "C4" = 4.3 m country-specific line cord. "R2" = 2.8 m C13-C14 rack power cable. "N" = Not included; see Power supplies and cables for the ordering information. * Processor details: Processor quantity and model, cores, thermal design power (TDP), and core speed. ^ The server supports one fixed power supply or up to two hot-swap (HS) power supplies. The SR250 server supports one Intel Xeon E, Core i3, Pentium Gold, or Celeron G processor. The following table lists the specifications of the processors. The following table lists feature codes for the processors that are available for the SR250 server. The SR250 server supports up to 4 TruDDR4 memory UDIMMs with ECC protection. The processor has two memory channels with two DIMMs per channel. Lenovo TruDDR4 memory uses the highest-quality components sourced from Tier 1 DRAM suppliers and only memory that meets strict requirements is selected. It is compatibility tested and tuned on every ThinkSystem server to maximize performance and reliability. TruDDR4 memory has a unique signature programmed into the DIMM, which enables Lenovo servers to verify whether the memory installed is qualified and supported. Lenovo qualified and supported TruDDR4 memory is covered by Lenovo warranty, and service and support provided worldwide. The server supports memory configurations with 1, 2, 3, or 4 UDIMMs. Mixing UDIMMs of different capacity is supported. All DIMMs in the server operate at the same speed up to 2666 MHz, which is determined by the maximum memory speed supported by the specific processor (see Processors for details). The server supports up to 64 GB of memory. The following table lists memory options available for the SR250 server. In addition, the SR250 server models can be configured with one internal M.2 SATA non-hot-swap SSD. The following figure shows the internal drive bay configurations. The following table lists the internal storage options for the SR250 server. * Factory-installed only, no field upgrade. The AnyBay backplane allows either SAS/SATA drives or NVMe PCIe drives in the drive bays 8 and 9. Configurations with NVMe PCIe drives are supported only for Machine Types 7Y51, 7Y52, and 7Y72; Machine Type 7Y73 does not support configurations with NVMe PCIe drives. Models with 4x 3.5" SS drive bays and an onboard SATA controller can be upgraded to support a hardware RAID controller or HBA by using the 4x3.5" SS Backplane Bracket Kit for HW RAID/HBA (4M17A14200). Models with 4x 3.5" SS drive bays can be upgraded to support 4x 3.5" HS drive bays and a hardware RAID controller or HBA by using the 3.5" HS SATA/SAS 4-Bay Backplane Cable Kit (4M17A13565). The kit includes the hot-swap backplane (B412) and the SAS/SATA cable for HW RAID/HBA (B415). Models with 4x 3.5" HS drive bays and an onboard SATA controller can be upgraded to support a hardware RAID controller or HBA by using the 3.5"/2.5" HS SAS/SATA x4 Cable for HW RAID/HBA (4Z57A12652) . Models with 8x 2.5" HS drive bays and an onboard SATA controller can be upgraded to support a hardware RAID controller or HBA by using two 3.5"/2.5" HS SAS/SATA x4 Cables for HW RAID/HBA (4Z57A12652). NVMe support: Two 3.5"/2.5" HS SAS/SATA x4 Cables for HW RAID/HBA (4Z57A12652) and two 10x2.5" HS NVMe Cables (4Z57A12651). No NVMe support: Three 3.5"/2.5" HS SAS/SATA x4 Cables for HW RAID/HBA (4Z57A12652). NVMe support: Two 10x2.5" HS NVMe Cables (4Z57A12651). No NVMe support: One 3.5"/2.5" HS SAS/SATA x4 Cable for HW RAID/HBA (4Z57A12652). Models with 10x 2.5" HS drive bays and an NVMe Switch Adapter can be upgraded to support a hardware RAID controller or HBA by using two 3.5"/2.5" HS SAS/SATA x4 Cables for HW RAID/HBA (4Z57A12652). Controllers for internal storage are not included with the field upgrade options. The M.2 SSD cannot be used in the configurations with eight drives that are connected to the onboard SATA controller (the SATA port 7 is shared between the drive bay 7 and the M.2 connector). The following table lists supported internal storage configurations with the SAS/SATA and AnyBay backplanes. * The number in brackets (x) specifies the quantity of drive bays connected to each of the controllers. The following table lists the storage controllers and options for internal storage of the SR250 server. * The onboard SATA controller integrated into the Intel C246 Platform Controller Hub (PCH) supports non-RAID (JBOD) AHCI mode or a hardware-assist, software RAID feature (Intel Rapid Storage Technology Enterprise [RSTe]). The onboard SATA controller does not consume a PCIe slot. The total quantity of the RAID 930-8i, 16i, and 8e controllers in the server must not exceed 1 (up to 1 supercapacitor can be mounted in the server). The 1610-4P NVMe Switch Adapter is supported in the PCIe slot 2 supplied by the PCIe x8 or x16 riser card. The 1610-4P NVMe Switch Adapter provides two PCIe 3.0 x4 ports for JBOD (non-RAID) connectivity to U.2 NVMe PCIe SSDs in the drive bays 8 and 9. 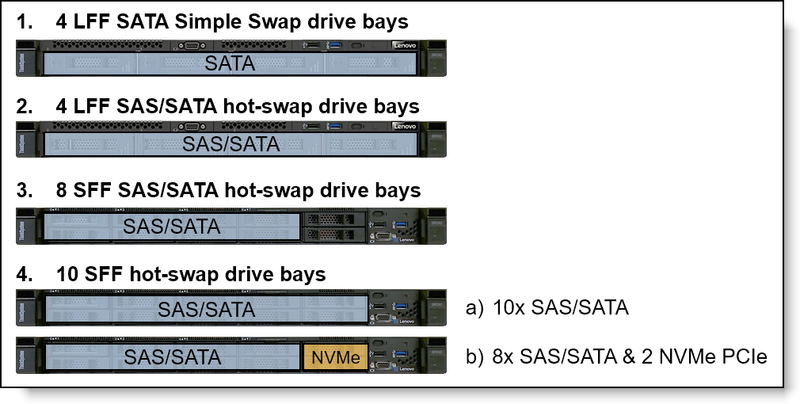 The following table summarizes features of supported SAS/SATA storage controllers. * HBAs do not support key management for SEDs; third-party host software is responsible for managing the keys. ** The SSD caching feature has been phased out in the new generation of advanced RAID controllers. The onboard Intel RSTe is not supported by virtualization hypervisors, including VMware vSphere (ESXi), Linux KVM, Xen, and Microsoft Hyper-V. The onboard Intel RSTe supports up to eight drives in a RAID-0 or RAID-5 array, two drives in a RAID-1 array, and four drives in a RAID-10 array. In a Windows Server-based environment, the onboard Intel RSTe supports up to six drives in a RAID-0 or RAID-5 array. The following tables list drive options for the SR250 server. * NVMe PCIe SSDs support informed hot removal and hot insertion, provided the operating system supports PCIe SSD hot-swap. The SR250 server supports the external USB optical drive option listed in the following table. The External USB DVD RW Optical Disk Drive supports the following types of media: CD-ROM, CD-R, CD-RW, DVD-R, DVD+R, DVD-ROM, DVD-RW, and DVD+RW. The SR250 server supports up to three PCIe slots: one slot on the system planar that supports an internal storage controller and up to two PCIe slots on a riser card. The following table lists available PCIe riser card options. A riser card is required. The PCIe x8 riser card supplies slots 1 and 2, and the PCIe x16 riser card supplies slot 2. The SR250 server supports two onboard Gigabit Ethernet network ports that are based on the Broadcom BCM5720 network interface controller (NIC) chip. The following table lists the network adapters that are supported with the SR250 server. ^ Field upgrade option only; no factory installation. * The adapter comes without transceivers or cables; for ordering information, see the configuration notes below the table. PCIe full-height network adapters are supported in the full-height PCIe slot 2 supplied by the PCIe x8 or x16 riser card. PCIe Low Profile network adapters are supported in the full-height and low profile slots supplied by the PCIe x8 or x16 riser card. Supported transceivers or DAC cables should be purchased for the SFP+ and SFP28 adapters, and UTP Category 6 or Category 5e cables should be purchased for the 10 GbE (Cat6) or 1 GbE (Cat5e or Cat6) RJ-45 adapters. The maximum number of transceivers or cables that are supported per adapter equals the quantity of the adapter ports, and all adapter ports must have the same type of the transceiver or cable selected. The following table lists cables for the 10 GbE and 1 GbE RJ-45 adapters. * Not supported with the Intel X710-DA4 network adapter (7XC7A05525). ** The Emulex VFA5.2 PCIe network adapters (00AG570 and 00AG580) do not support active SFP+ DAC cables. * Not supported with the Intel XXV710-DA2 PCIe 25Gb 2-Port SFP28 Ethernet Adapter (7XC7A05523). The following table lists SAS RAID controllers and HBAs for external storage attachments that are supported by the SR250 server. Low profile SAS RAID controllers and HBAs for external storage are supported in the low profile and full-high PCIe slots supplied by the x8 or x16 riser card. The following table summarizes features of supported RAID controllers and HBAs for external storage. The following table lists Fibre Channel HBAs supported by the SR250 server. Configuration note: FC HBAs are supported in the low profile and full-high PCIe slots supplied by the PCIe x8 or x16 riser card. The SR250 server supports graphics processing unit (GPU) adapters listed in the following table. The GPU adapters are supported only in the configurations with 450 W hot-swap power supplies. The GPU adapters are supported in the PCIe slot 2 supplied by the PCIe x8 or x16 riser card. The SR250 server ships with four non-hot-swap system fans. Configuration note: The server performance might be impacted in case of a system fan failure. The SR250 server supports one fixed power supply or up to two redundant hot-swap power supplies. With two power supplies, the server is capable of N+N redundancy depending on the configuration. A second power supply can be added to the models that come with one hot-swap power supply. The following table lists the power supply options. Configurations with 300 W fixed power supplies (feature code B40Q) are supported only for Machine Types 7Y51, 7Y52, and 7Y73. Configurations with 450 W hot-swap power supplies (4P57A12649) that are available worldwide (except India) are supported only for Machine Types 7Y51 and 7Y52. Configurations with 450 W hot-swap power supplies for India (4P57A16264) are supported only for Machine Type 7Y72. The SR250 server ship standard with or without a power cord (model dependent). A hot-swap power supply option ships without a power cord. The following table lists the country-specific line cords and rack power cables that can be ordered for the SR250 server. One or two power cables can be ordered, depending on the quantity of power supplies in the server. The SR250 server contains Lenovo XClarity Controller (XCC), which provides advanced service-processor control, monitoring, and alerting functions. XClarity Controller offers three functional levels: Standard, Advanced, and Enterprise. By default, the SR250 server includes XClarity Controller Standard features, and it can be upgraded to Advanced or Enterprise functionality by using the Features on Demand (FoD) upgrades. Note: Depending on the system settings, the front USB port can be assigned to XClarity Controller for management functions, or to the system as a regular USB 2.0 port, or switched between two functions by using the system ID button. The following table lists the XClarity Controller FoD upgrades. For factory-installed upgrades, either Standard to Advanced Upgrade (feature AVUT) or Standard to Enterprise Upgrade (feature AUPW) can be selected, but not both. For field upgrades, the Advanced to Enterprise Upgrade (4L47A09133) requires the Standard to Advanced Upgrade to be activated on the server previously with either the factory-installed feature AVUT or field upgrade 4L47A09132. Lenovo XClarity Provisioning Manager is a UEFI-embedded GUI application that combines the functions of configuring system setup settings, configuring RAID, and updating applications and firmware. It also enables you to install the supported operating systems and associated device drivers, run diagnostics, and collect service data. OneCLI is a collection of server management tools that utilize a command line interface program to manage firmware, hardware, and operating systems. It provides functions to collect full system health information (including health status), configure system setting, and update system firmware and drivers. Lenovo XClarity is a centralized systems management solution that helps administrators deliver infrastructure faster. This solution integrates easily with Lenovo x86 servers, certified nodes, appliances, RackSwitch switches, and select Lenovo storage, providing automated agent-less discovery, monitoring, firmware updates, configuration management, and bare metal deployment of operating systems and hypervisors across multiple servers. Lenovo XClarity Administrator is an optional software component for the SR250 server which can be downloaded and used at no charge to discover and monitor the SR250 and manage firmware upgrades for them. Lenovo XClarity Energy Manager provides a stand-alone, web-based agent-less power management console that provides real time data and enables you to observe, plan and manage power and cooling for Lenovo servers. Using built-in intelligence, it identifies server power consumption trends and ideal power settings and performs cooling analysis so that you can define and optimize power-saving policies. Lenovo XClarity Energy Manager is an optional software component for the SR250 server that is licensed on a per managed node basis, that is, each managed server requires a license. The 1-node Energy Manager license is included in the XClarity Controller Enterprise upgrade. To manage systems without XClarity Controller Enterprise licenses, a node license pack should be purchased. The following table lists the geo-specific Lenovo XClarity Energy Manager software license options. * NA = North America; AP = Asia Pacific. ** EMEA = Europe, Middle East, Africa; LA = Latin America. Lenovo Capacity Planner is a power consumption evaluation tool that enhances data center planning by enabling IT administrators and pre-sales professionals to understand various power characteristics of racks, servers, and other devices. Capacity Planner can dynamically calculate the power consumption, current, British Thermal Unit (BTU), and volt-ampere (VA) rating at the rack level, improving the planning efficiency for large scale deployments. The following table lists the security options that are available for the SR250 server. * Factory-installed only; no field upgrade. Lenovo Business Vantage is a security software tool suite (available only in PRC) designed to work with the Nationz TPM for enhanced security, to keep user data safe, and to erase confidential data completely from a hard disk drive. Encrypts files to ensure data safety by using the Nationz TPM. Erases confidential data from a hard disk. Prohibits unauthorized access to the USB port of devices. Encrypts files to ensure data security on a USB storage device. The following table lists the rack installation options that are available for the SR250 server. * If a 0U PDU used, the rack must be at least 1000 mm (39.37 in.) deep. The SR250 server complies with ASHRAE class A2 specifications. The server performance might be impacted when the operating temperature is outside the ASHRAE A2 specifications or in case of a system fan failure. Depending on the hardware configuration, some server models comply with ASHRAE class A3 specifications. To comply with ASHRAE class A3 specifications, the SR250 server models must be configured with 8x 2.5-inch hot-swap drive bays and a processor with up to 80 W TDP. The SR250 server comes with a three-year (Machine Type 7Y51) or one-year (Machine Type 7Y52) customer-replaceable unit (CRU) and onsite limited (for field-replaceable units [FRUs] only) warranty with standard call center support during normal business hours and 9x5 Next Business Day Parts Delivered. Lenovo’s additional support services provide a sophisticated, unified support structure for a customer's data center, with an experience consistently ranked number one in customer satisfaction worldwide. Direct technician-to-technician access through a dedicated phone line. Single point of contact service. End to end case management. 3rd Party collaborative software support. Online case tools and live chat support. 3, 4, or 5 years of service coverage. 1-year or 2-year post-warranty extensions. Foundation Service: 9x5 service coverage with next business day onsite response, with optional YourDrive YourData. Essential Service: 24x7 service coverage with 4-hour onsite response or 24-hour committed repair (available only in select countries), with optional YourDrive YourData. Advanced Service: 24x7 service coverage with 2-hour onsite response or 6-hour committed repair (available only in select countries), with optional YourDrive YourData. Lenovo Managed Services provide continuous 24x7 remote monitoring (plus 24x7 call center availability) and proactive management of a customer's data center using state of the art tools, systems, and practices by a team of highly skilled and experienced Lenovo services professionals. Quarterly reviews check error logs, verify firmware and operating system device driver levels, and software as needed. Lenovo will also maintain records of latest patches, critical updates, and firmware levels, to ensure customer's systems are providing business value through optimized performance. A Lenovo Technical Account Manager helps customers optimize operations of their data centers based on a deep understanding of customer's business. Customers gain direct access to a Lenovo TAM, who serves as their single point of contact to expedite service requests, provide status updates, and furnish reports to track incidents over time. Also, a TAM helps proactively make service recommendations and manage service relationship with Lenovo to make certain that customer's needs are met. Lenovo Enterprise Server Software Support is an additional support service that provides customers with software support on Microsoft, Red Hat, SUSE, and VMWare applications and systems. Around the clock availability for critical problems plus unlimited calls and incidents helps customers address challenges fast, without incremental costs. Support staff can answer troubleshooting and diagnostic questions, address product compatibility and interoperability issues, isolate causes of problems, report defects to software vendors, and more. Lenovo’s YourDrive YourData service is a multi-drive retention offering that ensures that customer's data is always under their control, regardless of the number of drives that are installed in their Lenovo server. In the unlikely event of a drive failure, customers retain possession of their drive while Lenovo replaces the failed drive part. Customer's data stays safely on customer premises, in their hands. The YourDrive YourData service can be purchased in convenient bundles with Foundation, Essential, or Advanced Service upgrades and extensions. Having a trusted partner who can perform regular and detailed health checks is central to maintaining efficiency and ensuring that customer systems and business are always running at their best. Health Check supports Lenovo-branded server, storage, and networking devices, as well as select Lenovo-supported products from other vendors that are sold by Lenovo or a Lenovo-Authorized Reseller. Lenovo Services is a dedicated partner to customer success. Lenovo's goal for customers is to reduce capital outlays, mitigate IT risks, and accelerate time to productivity. Asset Recovery Services (ARS) helps customers recover the maximum value from their end-of-life equipment in a cost-effective and secure way. On top of simplifying the transition from old to new equipment, ARS mitigates environmental and data security risks associated with data center equipment disposal. Lenovo ARS is a cash-back solution for equipment based on its remaining market value, yielding maximum value from aging assets and lowering total cost of ownership for customers. An assessment helps solve customer IT challenges through an onsite, multi-day session with a Lenovo technology expert. Lenovo performs a tools-based assessment which provides a comprehensive and thorough review of a company's environment and technology systems. In addition to the technology-based functional requirements, the consultant also discusses and records the non-functional business requirements, challenges, and constraints. Assessments help organizations, no matter how large or small, get a better return on their IT investment and overcome challenges in the ever-changing technology landscape. Professional Services consultants perform infrastructure design and implementation planning to support customer's strategy. The high-level architectures provided by the assessment service are turned into low level designs and wiring diagrams, which are reviewed and approved prior to implementation. The implementation plan will demonstrate an outcome-based proposal to provide business capabilities through infrastructure with a risk-mitigated project plan. Lenovo experts can seamlessly manage the physical installation of customer's server, storage, or networking hardware. Working at a time convenient for the customer (business hours or off shift), the technician will unpack and inspect the systems on customer site, install options, mount in a rack cabinet, connect to power and network, check and update firmware to the latest levels, verify operation, and dispose of the packaging, allowing customers to focus on other priorities. When investing in new IT infrastructures, customers need to ensure that their business will see quick time to value with little to no disruption. Lenovo deployments are designed by development and engineering teams who know Lenovo products and solutions better than anyone else, and Lenovo technicians own the process from delivery to completion. Lenovo will conduct remote preparation and planning, configure and integrate systems, validate systems, verify and update appliance firmware, train on administrative tasks, and provide post-deployment documentation. Customer’s IT teams leverage Lenovo skills to enable IT staff to transform with higher level roles and tasks. Integration, Migration, and Expansion Services allow to move existing physical and virtual workloads easily, or to determine technical requirements to support increased workloads while maximizing performance. These services include tuning, validation, and documenting ongoing run processes, and they leverage migration assessment planning documents to perform necessary migrations. Some service options may not be available in every country. For more information about Lenovo service offerings that are available in a specific country or area, contact a local Lenovo sales representative or business partner. The following table lists the 12 Gbps SAS external drive enclosures that are offered by Lenovo that can be used with the SR250 for storage expansion. The following table lists the external storage systems that are currently offered by Lenovo that can be used with the SR250 in IT solutions. The following table lists the external backup options that are offered by Lenovo that can be used with the SR250 in IT solutions. The following table lists the Ethernet LAN switches that are offered by Lenovo that can be used with the SR250 server in IT solutions. The following table lists currently available Fibre Channel SAN switches that are offered by Lenovo that can be used with the SR250 in IT solutions. The following table lists the rack cabinets that are offered by Lenovo that can be used with the SR250 server in IT solutions. The following table lists the KVM switches and consoles that are offered by Lenovo that can be used with the SR250 server in IT solutions. The following table lists the power distribution units (PDUs) that are offered by Lenovo that can be used with the SR250 server in IT solutions. The following table list the uninterruptible power supply (UPS) units that are currently offered by Lenovo that can be used with the SR250 in IT solutions. Hyper-V®, Microsoft®, PowerShell, Windows PowerShell®, Windows Server®, and Windows® are trademarks of Microsoft Corporation in the United States, other countries, or both.